944 Super Village Superfight presents: Jaidon Codrington vs. TBA, Hector Camacho Jr. vs Louis Lopez, Carlos de Leon Jr. vs. Dhafir Smith, David media vs Jose Luis Gonzales, Marvin Cordova Jr. vs. Darien Ford, Dante Moore vs. Derrick Thompson. Gates open at 11:00 am. 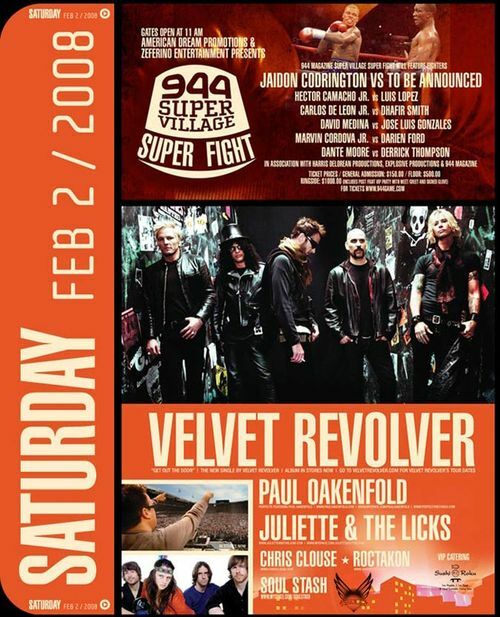 Velvet Revolver perform. Paul Oakenfold spins. Performance by Juliette & The licks. Rocktakon spins. Chris Clouse, Soul Stash perform.